Scenes from the OC87 Recovery Diaries video workshop at WHYY’s Dorrance H. Hamilton Media Commons. 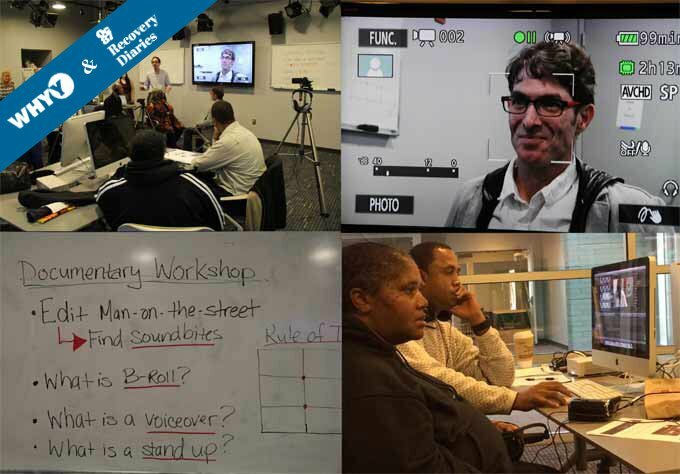 This fall, OC87 Recovery Diaries and public television station WHYY have teamed up with groups from four area mental health providers to create original short films that detail journeys of recovery and transformation. • Stories have always been a primal form of communication. • Stories are about collaboration and connection. • Stories are how we are wired. • Stories are the pathway to engaging our right brain and triggering our imagination. Through imagination, we tap into creativity that is the foundation of innovation, self-discovery and change. This list is at the very heart of OC87 Recovery Diaries, which is at the intersection of creative storytelling and mental health. Craig Santoro, WHYY’s Director of Media Instruction (standing at tripod) gives filmmakers instructions on using the camera. 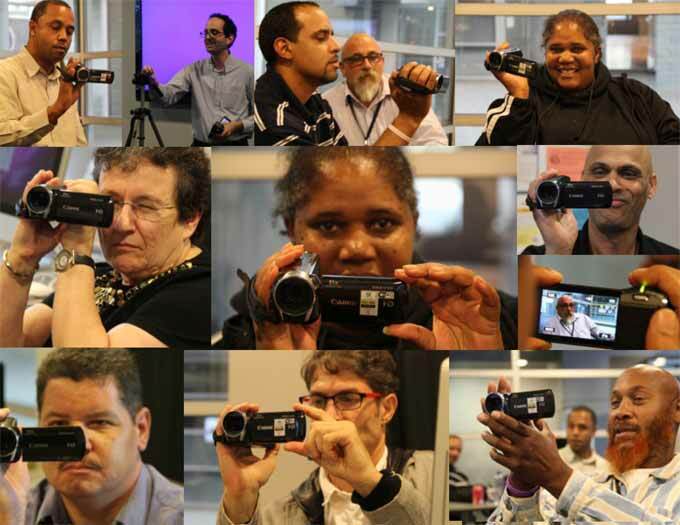 The first time filmmakers were given camera, tripod, and microphone and access to editing equipment at the Dorrance H. Hamilton Public Media Commons at WHYY. In addition, participants are being guided through the storytelling process – from initial concept to final post-production. 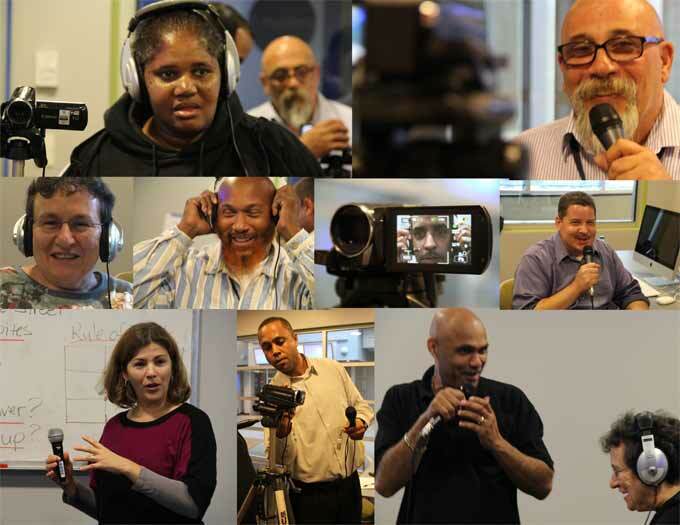 Maiken Scott (lower left), WHYY’s Behavioral Health Reporter, giving tips for successful interviews to video workshop participants. 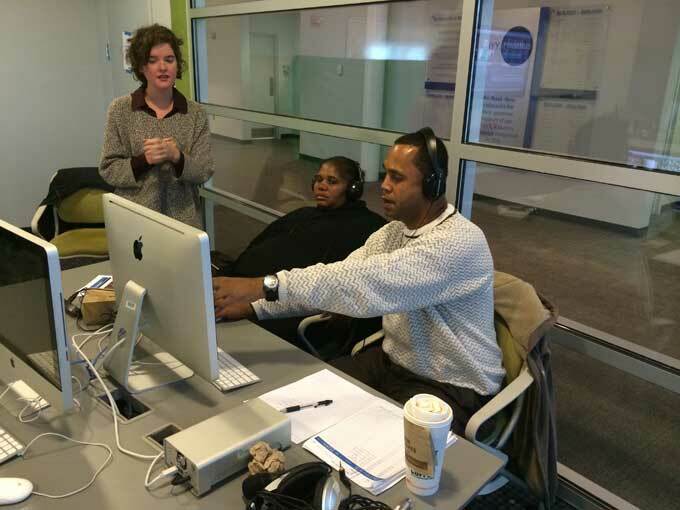 Associate Media Instructor Lisa Wilk helps filmmaking team Berta Britz, Robert D . Martin and Timothy Connors edit their project. Berta Britz, and Robert D. Martin, from Creating Increased Connections’ invited Timothy Connors from the Montgomery County Hearing Voices peer support groups to share his experience with hearing voices. In his film, Tim shares his recovery and he and his friends talk about how they have learned to create a healthy relationship with these voices. Through the support of family and groups Tim leads a happier and healthier life. Angelo Colon and John Rocco work on post production of their video. Angelo Colon and John Rocco, from NorthEast Treatment Centers chose to address stigma in their video project. Stigma often dictates the way we act and the things we feel we are able to do. Rocco shares his story of recovery, addiction, mental illness, and survival but makes clear these words do not define him but are a part of who he is today. WHYY’s Director of Media Instruction Craig Santoro assists William Lipscomb and Evan Kaplan edit their story. Evan Kaplan and William Lipscomb from Child and Family Connections, Inc. are working on a film that tells Evan’s story, which includes a scene from a very low point in his life when Evan planned his suicide. Through his relationship with his daughter and creation of support groups Evan has learned to live with his diagnosis and has many terrific reasons to live. Robert Cleveland and Arah Cooper work on their video, which features a piano performance by Arah. Arah Cooper and Robert Cleveland from Horizon House Inc. are telling Arah’s story of recovery. Arah shares that a key idea in her transformation from victim to survivor is forgiveness. In addition to other support systems, Arah plays piano to help her cope with her past in trauma. Production intern Laura Farrell consults with Robert Cleveland and Arah Cooper at the video workshop. Follow this link to see the completed shorts, along with comments from the filmmaking team about their experiences making the films. Follow this link to read Pamela Rutledge’s Psychology Today post on stories.